By Jim Dower: WBC super middleweight champion David Benavidez (20-0, 17 KOs) has changed his mind about wanting to sign with Top Rank, and he’s decided to return the $250,000 bonus he was given, according to ESPN. The 21-year-old Benavidez will be turning to his promoter Sampson Lewkowicz at Sampson Boxing. Last May, Benavidez accepted a $250K bonus from Top Rank to ink with them. Lewkowicz is said to have Benavidez under contract until 2021, and he was planning on suing Top Rank. Benavidez never fought for Top Rank since receiving the bonus. Top Rank has Benavidez’s older brother welterweight Jose Benavidez under contract, and he could be the next opponent for WBO welterweight champion Terence Crawford for his first defense. Top Rank blew it by not inking David Benavidez when he turned pro in 2013. Perhaps they didn’t think he was going to pan out back then. Benavidez, 21, was only 16-years-old back in 2013, so Top Rank might not have seen the potential in him back then. It’s hard to know sometimes how good fighter will become. If Top Rank could add the 6’2” Benavidez to their stable of fighters, they would have a guy to match against WBO 168lb champion Gilberto ‘Zurdo’ Ramirez in the future. Top Rank has been matching Ramirez agains soft opposition since he won the WBO tile two years ago. Pitting him against Benavidez would be a step up for Zurdo, who is being wasted with the opposition he’s been facing. Top Rank has promoted welterweight contender Jose Benavidez Jr. (27-0, 18 KOs), David’s older brother, for his entire eight-year career but passed on signing David when he turned pro in 2013. Lewkowicz signed him and guided him to becoming, at age 20, the youngest super middleweight world titleholder in boxing history when he survived a 12th-round knockdown and won a split decision over Ronald Gavril to claim a vacant 168-pound belt in September. Had Benavidez signed with Top Rank, he may have been out of action for a while until the legal case between Sampson Boxing and Top Rank was finished. 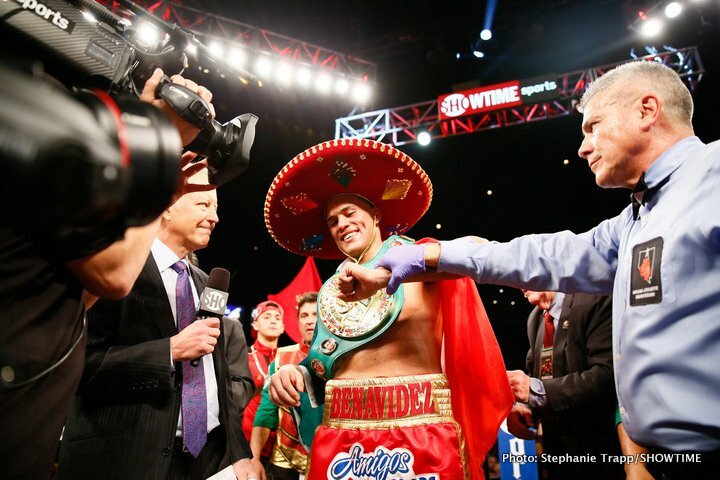 Benavidez won the WBC 168lb title last year in September in beating Ronald Gavril by a 12 round split decision. Benavidez looked weight drained in that fight. In their rematch, Benavidez defeated Gavril by a one-sided 12 round unanimous decision last February.